Here is some SAFETY info. Cooper Tire & Rubber Co. (Cooper) is recalling certain Roadmaster RM234 tires, size 295/75R22.5, manufactured August 6, 2015, to September 5, 2015 (weeks 3115-3515). The affected tires may have a pin-sized hole in the sidewall that can result in a loss of air. A loss of tire air pressure can cause sudden tire failure, increasing the risk of a crash. Cooper will notify owners, and dealers will replace the tires including the mounting and balancing, free of charge. The manufacturer has not yet provided a notification schedule. Owners may contact Cooper customer service at 1-800-854-6288. Cooper's number for this recall is 4Y. I have mentioned that reporting tire failures to NHTSA is something all RV owners should be doing. I also have mentioned that you need to be sure your tires are "registered" so that in the event of a recall the company can contact you. In the above notice it says the tire company will notify owners of suspect tires but if the owners didn't bother to register their tires there is no way the company or NHTSA can contact the owner. I and others really don't like the term "Safety Margin" as it sometimes implies something is safe when in reality all that can realistically be done is to lower the potential for problems. When it comes to tires the term "Reserve Load" is a more meaningful and descriptive term. We are discussing the difference between your actual load vs the load carrying capacity of a tire at a specific inflation. If you had a measured load of 4,500# on the heavier end of an axle and your tires was capable of supporting 4,950# at the cold inflation pressure you set the tire to, you would have a "reserve load" of 450# or 10%. To put this figure in perspective most cars have a reserve load capacity of 12% to over 20%. We have covered proper weighing methods and the importance of having a margin of inflation pressure above the minimum needed to carry the actual measured load you are placing on your tires. So I would ask. Do you know what your reserve load is for the heavier end of each axle? Despite the above, I occasionally get asked about a tire's "Safety Margin". When asked this question it sounds as if the person is intending to load the tire up to 100% of its rated load plus the additional percent that might be provided by the "safety margin". This is definitely not a good or safe practice. Yes, some tires may be able to carry more than the max load marked on the tire sidewall (at least for a short time) but I think it is better to think of the average margin rather than the minimum margin. Federal regulations specify that "all" tires must be able to pass certain tests. So that means 100% of the tires sold are suppose to be able to pass the required tests. Some also want to believe that passing a test that is run on a smooth drum under controlled conditions can always be used to accurately predict trouble free use in real life. Everyone should understand the concept of product variation. This results from variation in raw materials as well as in variation in the manufacturing process and even variation in testing. 1st tier tire companies have statisticians whose job it is is to target towards minimizing variations mentioned as well as the probability of stacked tolerances to aim for 99.99966% good product hens the term Six-Sigma. Now not all companies use the concept of six-sigma as this requires a real commitment to ever improving quality from top management all they way down to the night janitor. Such a commitment takes real work, can be expensive and require very involved quality control. Some companies are probably satisfied with 99.9% or maybe 97% or 80% or even lower as they are willing to take a chance that they will not be caught in violation of regulations or that the warranty will expire early enough that there will be no cost to the company for their poor quality. IMO there are companies that no only do not apply statistical quality control such as practiced by 1st tier tire companies and the major car companies of the world, but some companies may not even understand the concept of real quality control. A company can improve the quality i.e. get closer to 100% good, by over designing the product but if you have large variation you will be building a large number of products that are capable of handling 110% or maybe even 130% of the performance that is needed and this raises cost. Sometimes to the point of pricing yourself out of the market. Lets assume there was an easy way to measure the quality of tires (remember there is no such test) and we could come up with some numbers. If our target was 7,000 and we were to test a hundred tires from company Q and found that some failed as early as 5000 while others achieved 9000 we could calculate the mean or average and estimate say7500 so some might claim a "safety margin" of 500 (Mean performance minus the goal) when in reality some people would end up with tires that were only capable of 5000. Now if there is a second company Z and with the same test we see that the range was 7000 to a high of 7800 for an average of 7400, would you say the quality or safety margin of these tires was not as good as those from company Q? After all company Q achieved 7500 while company Z only achieved 7400. How would you feel if you ended up buying a tire from company Q that only could achieve 5600? I hope you can see that measuring tire quality can be a very complex issue. IMO one reasonable way for consumers to estimate the real quality of a product is to look at the basic warranty. Warranty costs are many times greater than the basic cost associated with replacing a product and in the case of tires could amount to as much as three to five times the cost to the corporation of producing a tire in the first place so companies really want to avoid warranty costs. There are a couple ways to avoid warranty costs. One is to make a good quality product and another is to cut back on the coverage provided by a warranty. If company Z offers say a 3 year warranty while company Q only offers 12 months or maybe as low as 30 day I think it's a safe bet that tires made by company Z have a much better "Safety Margin" and probably a lower potential for failure. Rather than worrying about the "margin" of tire brand Q vs brand Z on a theoretical test, I suggest it is better to ensure that your personal "Reserve" is reasonable. 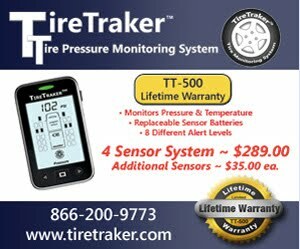 To learn what your reserve is you of course need to know your real tire load and that your pressure gauge is accurate and most importantly that at no time you operate your vehicle at a lower than specified pressure and if possible always run a bit more air pressure than the minimum needed to carry the load. I found significant discussion on tire 'maximum pressure" on a forum thread on a new Michelin tire. One problem is that the new tire is not yet available in the market so getting confirmation on what the tire has for markings on the sidewall was based on second hand information from various Michelin sources. Despite these problems I felt it might be instructive to review the relationship between load capacity and inflation pressure. The Michelin LTX M/S2 P235/75R15XL 108T carries its rated load at 41 PSI. Yet the maximum pressure stated on the tire is 50 PSI. There is no load capacity increase above 41 PSI. As I have previously reported the numbers associated with the "complete" size nomenclature are very important. In the above thread there were a number of readers confusing the inflation associated with the max load capacity with a statement on the tire about safety and tire inflation. When discussing Load and inflation it should be easy to read the tire as the max load and the inflation needed to support that load are clearly stated together. There is also a "Safety Warning" on many passenger and similar info on LT tires that includes a statement about "max inflation" but that number is really the max pressure that should ever be used when inflating a tire to ensure proper seating of the tire bead against the rim. This number is not associated with the load carrying capacity of the tire. Now while the above are from a passenger tire that was convenient for me to get pictures of, I know that you should see similar on your ST or LT type tires. I think you may learn a bit more about your own tires if you take a moment to read the information provided. Knowing what tires say on the sidewall can help avoid making mistakes when assumptions are made. It might be a good idea to take a few minutes to go and read your tire sidewall. You might be surprised what you can learn. I noted in an RV forum someone was changing from one brand tire to another brand. One reason given for the brand change was because they had suffered two "zipper" failures with their 22.5" steel body radials. As I do many times when reading RV forums, I posted a link to an earlier post in this blog where I had suggested that a "zipper" failure can occur with any brand steel body radial. As I try to support my statements with more than just my opinion I dug out an article from Tire Business magazine. In the article it was pointed out that "circumferential fatigue ruptures - known in the trade as 'zippers' in steel radial truck tires" are a failure that can have serious safety consequences and are not just an inconvenience to the RV traveler. The article goes on to point out that "a zipper rupture is a tire failure in which the tire blows out in the upper sidewall, leaving an even line of broken steel cords exposed, which gives it the appearance of an open zipper. They are typically 10 to 12 inches long but can extend up to 36 inches in length." The large amount of flexing can occur when a tire is significantly under-inflated. When one tire in a pair of duals looses air it can mean the failure takes longer to become obvious and in the meantime structural damage is being done to the tire that had not lost air but is now being asked to carry up to 100% more load than normal. 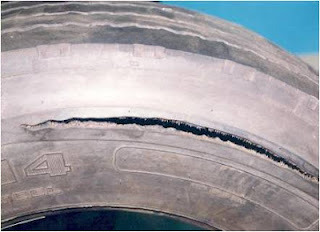 What makes this type of failure dangerous is that it is entirely possible for a number of steel body cords to have failed but the rubber in the sidewall has not ruptured at the now low inflation pressure. If that has occurred and the RV owner happens to discover a tire with low pressure then decides to "fix" things by re-inflating the low tire, the damaged tire may now rupture with explosive force when higher pressure air is introduced to the tire. If you wonder what can happen when a tire explodes a simple Google search of "tire explosion" will return just too many results. Or you can watch this compilation video and ask yourself if you would want to be adding air to any of these tires.